For the life of us, we’ll never understand the affinity that straight boy hockey fans have with ‘professional’ wrestling. The first we ever heard of CM Punk was on Twitter, and to be honest, we’re not interested in learning any more. Our pro wrestling interest peaked in 6th grade with Haystacks Calhoun and Johnny Powers. Yeah, that’s how old we are. We see pro wrestling as nothing more than Broadway for straight guys. Still, we suffer through wrestling tweets just as we do during baseball season, because that’s how much we adore our hockey guys. Saturday will find us in the company of a wrestler. A real wrestler. A three-time NCAA, D-1 All-American, Hudson Taylor. Hudson, one of the top five grapplers in NCAA history, first made his mark at the University of Maryland. He hit our radar screens in 2010, when profiled in the Washington Post. It was love at first sight – a straight athlete who is a tireless advocate for a more inclusive and tolerant sports culture. 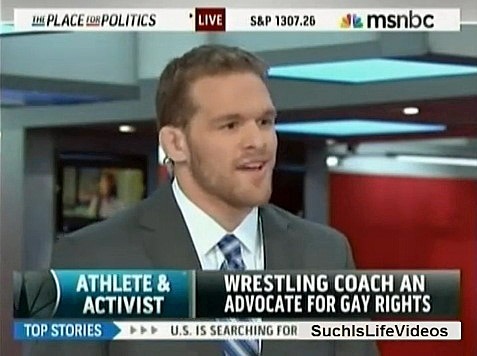 After leaving College Park, Hudson went on to become an assistant wrestling coach at Columbia University (Go Lions! ), and then later founded Athlete Ally, in December 2010. In less than a year, he’s made quite the splash. There are few in the amateur or professional sporting ranks that aren’t aware of Hudson’s efforts. Not long after launch, we reached out to him and became email pals. We finally get to meet him this weekend. Hudson will be the special guest at the Team DC Champions Awards reception on Saturday evening at HRC HQ. Team DC is the defacto clearinghouse and federation for individual and team sports for the DCGLBT community. As if we weren’t nervous enough already, Brent Minor, Program Director at Team DC, has given us the honors of introducing Hudson on Saturday. Our prepared remarks are coming together, although they’ll probably run a little long. That leaves just one outstanding issue for us, attire. We’re still trying to determine if ‘business casual’ means a Brooks Laich jersey. The Caps host the Red Wings on Saturday, so technically, it is a work night for us.